Welcome to Anton Guest House Bed & Breakfast Shrewsbury, luxury B&B accommodation in Shrewsbury, Shropshire. 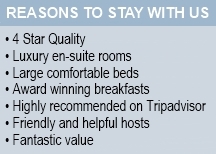 We offer four star quality ensuite bed and breakfast accommodation with comfortable beds, delicious breakfasts and a relaxing atmosphere in which to enjoy the many delights of Shrewsbury. 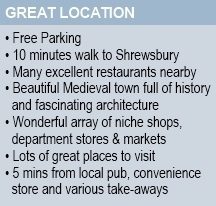 We are conveniently located a short walk from Shrewsbury town centre with free parking right outside the guest house. Shrewsbury Abbey is just around the corner, along with plenty of shops, bars, cafés and some fabulous restaurants. Our award winning Breakfast menu offers plenty of choice and breakfasts are freshly prepared for each guest from quality local ingredients. The guest house, originally a Victorian Gentleman's residence built around 1892, is full of the charm and character that epitomised the era. All rooms have kingsize or superking beds with many luxury touches including LCD TV & DVD player, free WiFi, dressing gowns, organic toiletries, well stocked welcome trays, Lindt chocolates and more. If you're looking for bed and breakfast accommodation in Shrewsbury, call Louise on 01743 359275 and rest assured, we'll do our best to make your stay an enjoyable one. Anton Guest House Bed & Breakfast Shrewsbury, the perfect base from which to explore the many delights of Shropshire. Anton Guest House Bed and Breakfast 1 Canon Street, Shrewsbury, Shropshire, SY2 5HG.